Patients who leave operating theatres with surgical equipment accidentally left inside them are being awarded millions of pounds in compensation. About two people a week find surgeons have left behind foreign objects such as surgical swabs, clips and screws, according to Government figures released after a Freedom of Information request. And with the average victim pocketing £17,900, the mistakes have cost the NHS a total of £9million over the past five years, with payouts made to more than 550 patients. In the past year, the highest payouts were £115,000 to a person who had the tip of a needle left inside them, £75,000 to a patient who later found a surgical clip and £60,000 to someone who still had ‘packaging material’ inside them after an operation. The total compensation bill during 2007-2008 for such incidents was £2.2million, considerably more than the £1.4million awarded in 2003-2004, even though the number of incidents has not increased. The average payment has also risen from £15,000 just under two years ago. In 2006-2007, the damages reached a record level of £2.6million paid to 149 patients, including £119,000 to one patient found to have had a swab left behind and £100,000 to another who had a clip left inside them. One victim was grandmother Gladys Condlyffe, 71, from Porthill, Staffordshire, who died in 2005 after surgeons accidentally left a plastic stent – a small pipe – inside her for seven years after a routine gall bladder operation. She died 12 hours after an operation to have it removed at the University Hospital of North Staffordshire. In 2007, two new mothers were sent home from Birmingham’s City Hospital with surgical swabs inside them after bungled emergency caesareans. Experts suggest the level of claims is just the tip of the iceberg, as many people do not discover a mistake unless it causes a problem, often years later. The incidents generally happen as a result of oversights by doctors under pressure in ‘stressful situations’, such as emergency operations. Overweight patients are also more likely to be affected because their extra body mass can make it more difficult to spot tools that have been left behind. Peter Walsh, chief executive of the patients’ charity Action Against Medical Accidents, said the figures were scandalous and disappointing. A list of ‘never events’ – those which are serious and largely preventable – drawn up by the National Patient Safety Agency after Lord Darzi’s review of the NHS, is currently out for consultation. 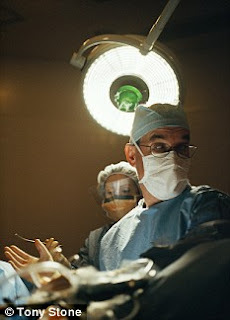 It includes objects being left in the body after an operation.